View the spectacle of Canada’s largest outdoor drive through Christmas light display at the BHP Billiton Enchanted Forest Holiday Light Tour (end of November - mid January) . Be filled with the wonders of the holiday season – presents, snowmen, reindeer, candy and more! See what’s hot in holiday decorating at The Festival of Trees (end of November) at Western Development Museum. Lavishly decorated trees, wreaths, gingerbread houses are sure to inspire you. To get a jump on your Christmas shopping be sure to stop in at the Western Development Museum's Christmas Craft Fair (mid-October) , or the Sundog Arts & Entertainment Faire (end of November to the first weekend in December) to find a unique gift for that special person. Celebrate Saskatoon’s cool culture at PotashCorp WinterShines (end of January – early February) . Enjoy live entertainment, an ice carving festival, cultural performances, cross country skiing, a hockey tournament and more! Take the kids skating at the Meewasin Rink (winter weather dependent) beside the Delta Bessborough Hotel. Skate rentals are available by donation. If you want to relax, enjoy a leisurely horse drawn cutter ride (weekends – weather permitting) in Kiwanis Memorial Park. 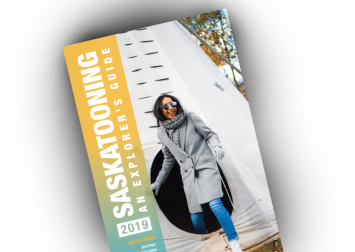 Dress warmly and enjoy winter in Saskatoon!